Finally, a Kava supplement product that any responsible adult can enjoy; Kona Kava Farm's Instant Kava Drink Mix. This instant Kava mix contains a genuine extract of Kava root and not something only "micronized." 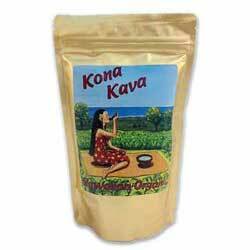 Typically, competing products grind the Kava powder so fine that it seems as though it dissolves in water, but Kona Kava Farm's Instant Kava Mix will dissolve completely. This saves the mess of extractions with plain Kava root; a ritual that many people enjoy, but also one that many customers find inconvenient. For a delicious supplement that naturally promotes relaxation and helps ease the mind from daily stress,* this instant drink mix supplement supplies a concentrated extract (4:1) of Kava root (Piper methysticum) in a delicious blend of all-natural ingredients: banana powder extract, vanilla bean powder extract, chocolate powder extract, vanilla liquid extract, and pineapple powder extract.